Browsing: / Home / 2010 / June / WhereÔÇÖs the funding for Basic Research? WhereÔÇÖs the funding for Basic Research? After attending Nordic Green II and Building Innovation Bridges between US and Europe, I became curious about just how much the US spends on basic research and where does it go. Turns out our government publishes this data and itÔÇÖs really quite interesting. 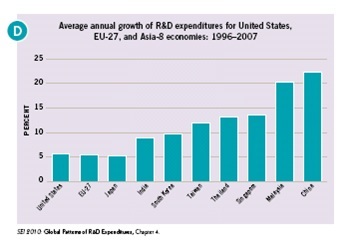 In the US, unlike most other countries, industry is responsible for the bulk of R&D investment and has been since 1980. In 2008, 67% of the estimated total was sponsored by industry followed by 26% from the federal government and the remaining 7% from educational institutions and other non-profits. 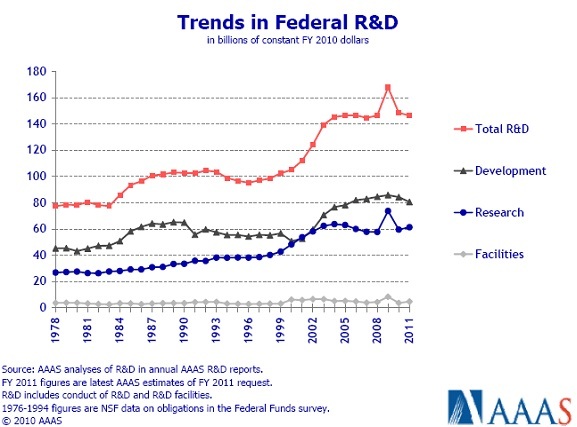 The majority of the industry funds (78%) are for applied research and development while basic research gets 60% of its funding from the federal government. 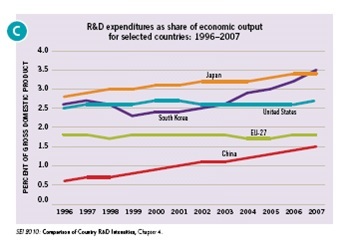 Globally, the US in sheer dollar value, spends the most on R&D estimated at $398 billion in 2008. 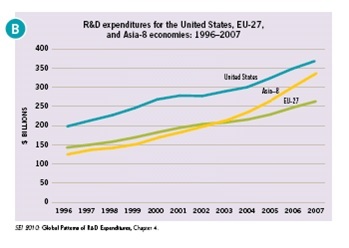 The rapidly growing R&D expenditures of the Asia-8 economies (China, India, Japan, Malaysia, Singapore, South Korea, Taiwan, and Thailand) surpassed those of the EU-27 in 2003. When it comes to R&D intensity – how much of a countryÔÇÖs economic activity (gross domestic product) it reinvests – Asia takes the lead. The Asia-8 have increased their intensity with South Korea committing 3.5% of its GDP followed closely by Japan at 3.4% of its GDP. Both the EU-27 and the US have remained steady and well below the 3% mark. As noted in the Proceedings of the Sino-US Forum on Basic Science for the Next Fifteen Years, numerous economic studies have indicated that up to 50 percent of economic growth can be attributed to research and development (R&D), with basic research as the driving force. These analyses also indicate that the social rate of return on investments in basic research is twice the private rate of return, suggesting that government is more likely to invest in basic research than private industry, and also that government investments leverage substantial research investments from other sources, primarily industry. Basic research is also essential in teaching new generations of scientists and engineers about the detailed assumptions and processes of science, no matter what their ultimate career choices turn out to be. In particular, individuals who have received basic research experience at the PhD level constitute a key resource for translating scientific results into economic growth. ItÔÇÖs interesting to note that ObamaÔÇÖs 2011 budget plans for a 3.5% decrease in applied research funds while it increases basic research by 4.1%…assuming the budget gets passed. The total amount has remained relatively stable despite multiple administrations, with the exception of the 2009 blip for the American Recovery and Reinvestment Act. This is not the way the US will remain competitive in the global economy.